Discover the contemporary and elegant design of the 170 rooms and 28 suites with comfortable amenities such as desk, Internet access, air-conditioning, coffee and tea making facilities, mini bar and 24 -hour room service. All rooms are equiped with an upscale range of innovative, modern amenities and services, including high-speed internet. All guest rooms include features such as climate control, multi-satellite and cable television, as well as ergonomic work areas that are designed specifically with business guests in mind. 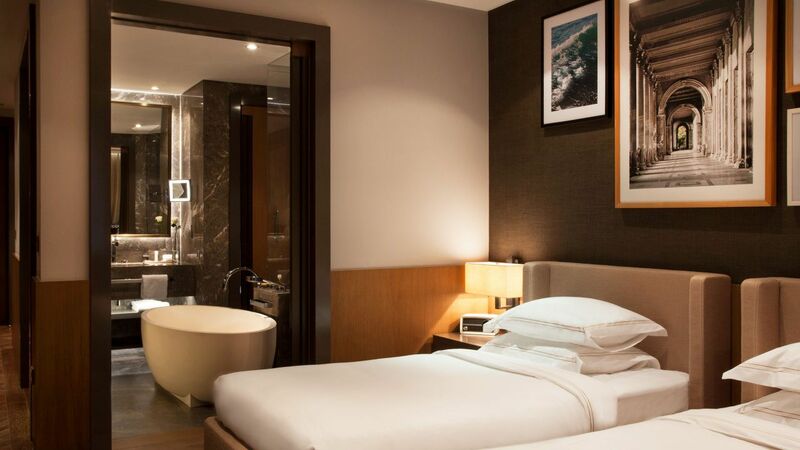 Each room will have stylish and comfortable interiors – including spacious bathrooms with a full set of amenities. To ensure guests enjoy the stunning views of the Black Sea and the city, each room has floor-to-ceiling windows and spacious balconies that provide spectacular views of the beautiful local scenery. 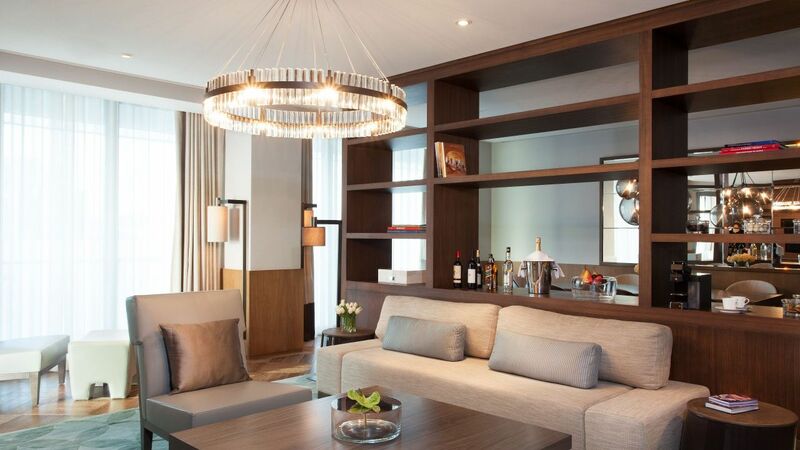 This large 78-sqm suite comes appointed with warm, wood panelling and elegant parquet floors. Guests will enjoy a large living room, a work desk with complimentary Wi-Fi, one king bed topped with British cotton linens and a spacious marble bathroom with walk-in shower and separate tub. 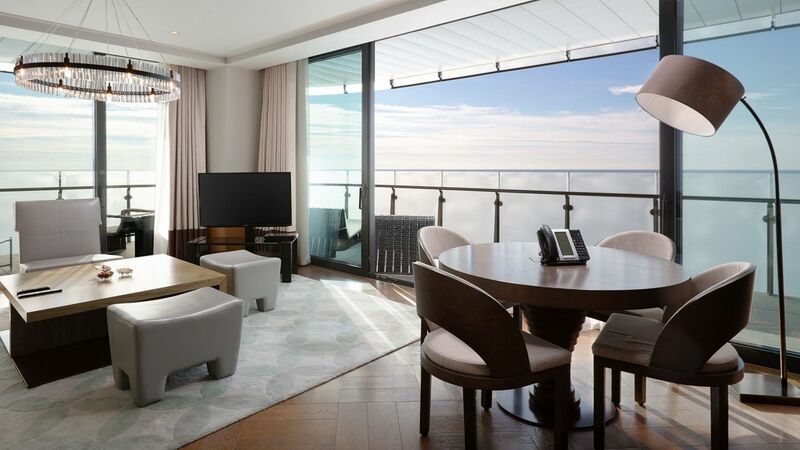 A balcony and floor-to-ceiling windows grant panoramic views of the city and Sochi Sea Port. Includes Regency Club access with refreshments during the day and cocktails in the evening. This is a standard suite. See World of Hyatt program terms for upgrade eligibility. 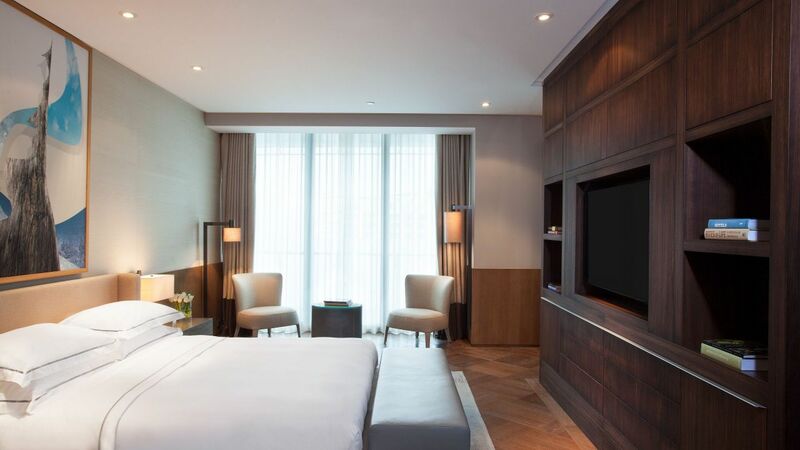 Ideal for families or long stay business travellers, this spacious 118-sqm two-room suite comes appointed with warm, wood panelling and elegant parquet floors. Guests will find one king bed topped with cotton linens, a separate living room with panoramic Black Sea view and two large luxurious marble bathrooms with a walk-in shower and a separate bathtub. Includes Regency Club access with refreshments during the day and cocktails in the evening. This is a premium suite. See World of Hyatt program terms for upgrade eligibility. Featuring French doors that open onto a spacious terrace with panoramic views of the Black Sea, Sochi Sea Port and the city, this grand 157-sqm two-room suite comes appointed with warm, wood panelling and elegant parquet floors. Guests will find one king bed topped with cotton linens, private kitchen, separate living and dining areas and two large luxurious marble bathrooms. Includes Regency Club access with refreshments during the day and cocktails in the evening. This is a premium suite. See World of Hyatt program terms for upgrade eligibility. This luxurious 191-sqm three-room suite, located on the top floors of the hotel, comes appointed with warm, wood panelling and parquet floors. Guests will enjoy a private kitchen, separate living room, dining room for up to 10 people, home cinema, one king bed topped with cotton linens and master bathroom featuring a marble tub and a large rain and steam shower. Floor-to-ceiling windows and a large terrace grant panoramic views of the Black Sea. Includes Regency Club access. Includes Regency Club services, such as refreshments during the day and cocktails in the evening. This is a premium suite. See World of Hyatt program terms for upgrade eligibility. Enjoy the magnificent panoramic Black Sea view in this spacious 78-sqm Regency Suite Sea View. This two-room Suite has stylish design with high-quality natural materials and spacious terrace. The Suite can be connected with a twin room with sea view for ideal family accommodation. Bedroom with king-size bed, big bathroom, bright living room with floor-to-ceiling windows and most picturesque views are the best companions for your comfortable staying. Includes Regency Club access with refreshments during the day and cocktails in the evening. Steel grey walls offset by wood paneling and parquet floors create an ambience of modern harmony in this 37- to 41-sqm guestroom that comes appointed with a dedicated work area and one king bed topped with British cotton linens. The balcony grants views of the city and Black Sea coast, while a walk-in shower and separate tub await in the spacious marble bathroom that can be accessed from two entrances. Steel grey walls offset by wood paneling and parquet floors create an ambience of modern harmony in this 37- to 41-sqm guestroom that comes appointed with a work desk area and two twin beds topped with British cotton linens. The balcony grants views of the city and Black Sea coast, while a walk-in shower and separate tub await in the spacious marble bathroom that can be accessed from two entrances. 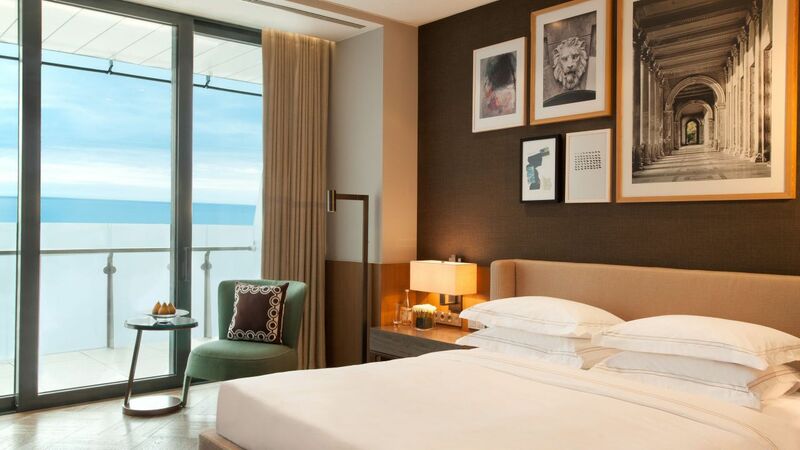 Wake up with the incredible Black Sea View in this 37- to 41-sqm guestroom that comes appointed with a dedicated work desk area and one king bed topped with British cotton linens. A balcony and floor-to-ceiling windows will present you a magnificent view. Steel grey walls offset by warm, wood paneling and parquet floors create an ambience of modern harmony. Enjoy a walk-in shower and separate tub await in the spacious marble bathroom. 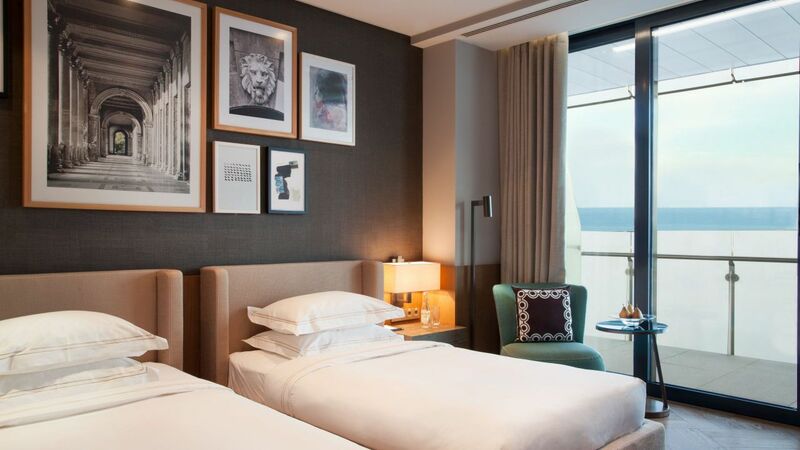 Wake up with the incredible Black Sea View in this 37- to 41-sqm guestroom that comes appointed with a dedicated work desk area and 2 twin beds topped with British cotton linens. A balcony and floor-to-ceiling windows will present you a magnificent view. Steel grey walls offset by warm, wood paneling and parquet floors create an ambience of modern harmony. Enjoy a walk-in shower and separate tub await in the spacious marble bathroom. This 14th floor located 37- to 41-sqm guestroom with Regency Club Access will give you an unforgettable comfort. Includes Regency Club services, such as refreshments during the day and cocktails in the evening. Enjoy the best views of the Black sea throw the floor-to-ceiling windows or on your balcony. Steel grey walls offset by warm, wood paneling and parquet floors create an ambience of modern harmony. Especially for you this spacious room comes appointed with work desk area and one king bed topped with British cotton linens. Also a walk-in shower and separate tub await in the spacious marble bathroom. 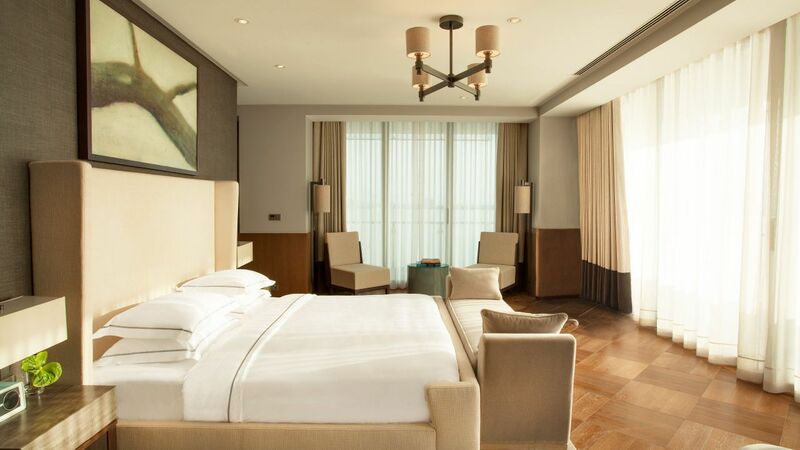 This 14th floor located 37- to 41-sqm guestroom with Regency Club Access will give you an unforgettable comfort. Includes Regency Club services, such as refreshments during the day and cocktails in the evening. 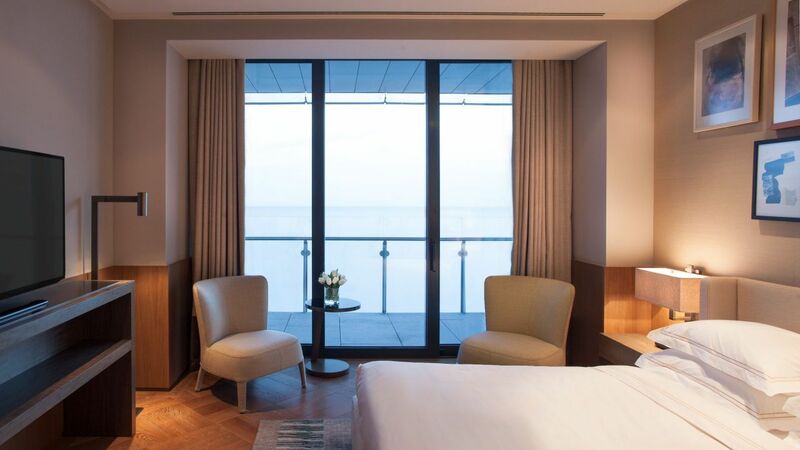 Enjoy the best views of the Black sea throw the floor-to-ceiling windows or on your balcony. Steel grey walls offset by warm, wood paneling and parquet floors create an ambience of modern harmony. Especially for you this spacious room comes appointed with work desk area and two twin beds topped with British cotton linens. Also a walk-in shower and separate tub await in the spacious marble bathroom.